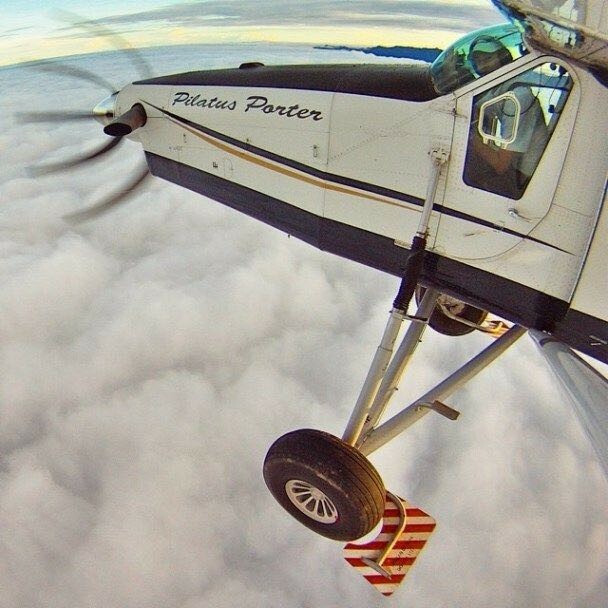 What's the function of the plate behind the wheels of the Pilatus Porter? Anyone knows what's the plate behind the wheel of the Pilatus Porter for? Looks like a sort of gravel kit. Real gravel kits are used by jet powered aircraft to land on rough airfields. In this case though, the engine is in front, so it is likely that it is only there to reduce the amount of dirt raised when landing/taking-off so to reduce the chances of damaging the aircraft. Federico hit the nail on the head. It’s a gravel kit and works similar to the mud flaps on trucks. On rough airstrips, it prevents rocks, gravel and other FOD from striking the airframe and damaging it during the ground roll. Not the answer you're looking for? Browse other questions tagged commercial-aviation feature-identification airplane or ask your own question. What is the working principle of gravel kits? What's this hole on the ATR-72? What is this device below the door of a 737 (and other aircraft)? What's the shortest amount of time a commercial airplane will be on the ground in between flights? What is the function of the protruding outlet on the Trent XWB? Is wheel well overheat detection (not brake temperature sensor) necessary for commercial jet aircraft? What is this air-scoop behind the cockpit of the Polikarpov I-153 and Stearman? What is this fairing on a Cessna 421? What's the difference between a propeller that is installed infront of the airplane (nose) and a propeller that is installed behind the nose? Are there any airplanes with the Centre of Gravity behind the Centre of Pressure?